…EVERYONE just loves your artwork. You did a great job. We look at Opie's portrait all the time and still are amazed at what a wonderful job you did. You captured his essence beyond words. Lisa did an excellent job of capturing Bailey's expression and personality. This lifelike portrayal is one of her great attributes as an artist. We were astounded to get our first glimpse of the finished work. The quality and personal nature of the portrait make it extremely valuable to us. Her work serves as a priceless treasure for pet lovers. 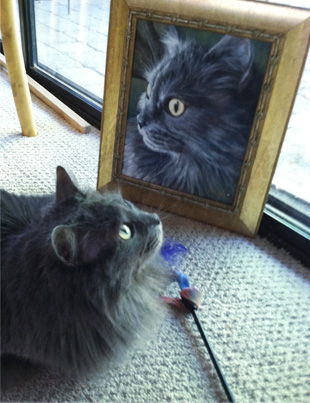 Pets capture our hearts and Lisa knows how to capture the pet's inner and outer beauty. When I first caught a glimpse of one of Lisa's pet paintings, I was immediately drawn into the love and warmth that only a loving pet can provide. Pet owners know what I'm talking about. It's a sense of calm or pure joy or a memory of all that is good in ones best friend. Romantic yet realistic, you can feel the love in every brush stroke. The painting was totally right. You pictured her just as she was. When we got her, we were told she'd been weaned too soon; and possibly as a result, she was a little standoffish. She was very good-natured and wanted to be near people, but she wasn't necessarily comfortable being held. Her substitute seemed to be finding tight spots to lay down and watch from. Usually, it was someplace a little removed and by herself, but sometimes it was right in the middle of things. It was one of those moments that I captured in the photo and you captured so perfectly in the painting. Every time we look at the painting, we get a reminder of that gaze of hers, so relaxed and happy in the most preposterous and seemingly uncomfortable spot. It always gave us a smile when she was with us, and the painting does, too. It was such a gift to learn that you do these paintings and to be able to do this as a way to remember her. I have an art history degree as well as museum and gallery experience. No matter about degrees or experience, I still believe that one should purchase art that one falls in love with. The first time I saw one of Lisa's pet portraits, I fell in love and found myself wanting to know the pet. What differentiates Lisa's artwork is her ability to capture the souls of these adorable creatures. If the eyes are the windows to the soul, then Lisa has mastered it. Her "up close and personal" approach is unique. The furry faces are adorable and she can creatively add words and names around the edges of the canvas which makes each commission even more precious to the lucky owner. The best part is that these lovely oil paintings produce heartfelt "smiles" which not all art can do. Priceless! Artwork is commissioned for personal use only and may not be used for financial gain. Artist retains full reproduction copyright on all work. Copyright © 2012 Lisa LaTourette. All rights reserved.